I love this time of year for the cool weather, spring flowers and cherry blossoms. Sakura festivals happen around this time in Vancouver and people drive around town looking for streets full of cherry blossoms. You can find Sakura themed treats and drinks everywhere. Even Starbucks had their Sakura Cherry Blossom Frap that I made last year. We are pretty crazy for cherry blossoms but not as crazy as in Japan. Since the season is so short they preserve them in salt. I got my friend to buy some from Japan. I couldn’t decide what to make with them but I knew I wanted to make something special. I finally decided to make this cherry blossom milk pudding. Because they looked so pretty. 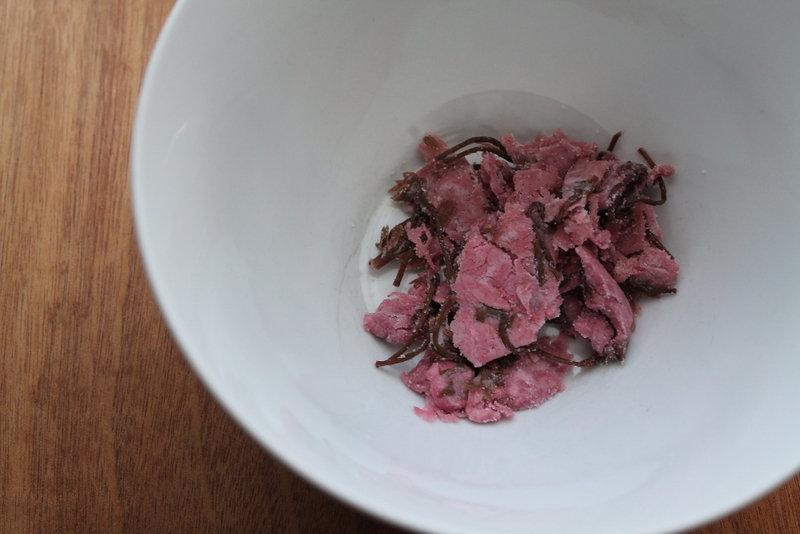 To make these, first you will need to soak the cherry blossoms to remove the salt. 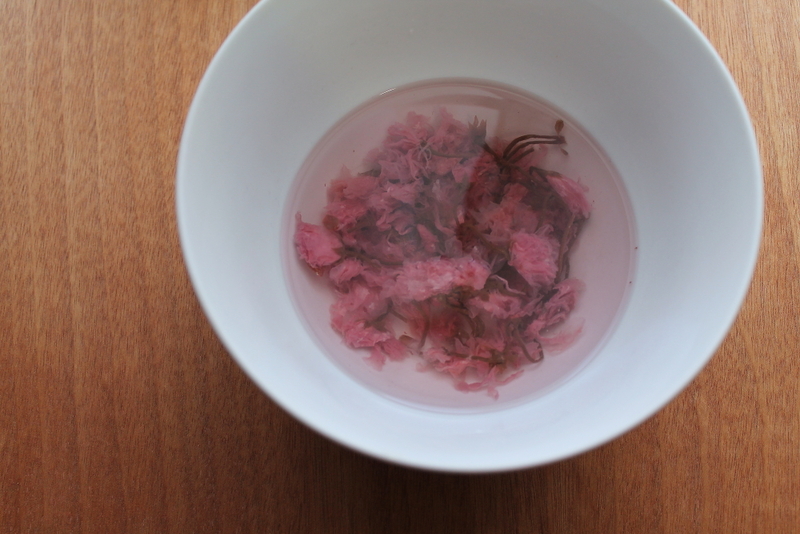 Some people use the preserved cherry blossom in tea. I tasted the water and it kind of tastes like the Chinese salted plums. A little sweet and salty. Next you want to make the milk pudding. This is simple. You need milk, gelatin, sugar, heavy cream and yogurt. In a sauce pan, heat up the milk (just about to boil) and sugar. To this add the gelatin and stir to dissolve. In another bowl mix together the yogurt and heavy cream. Slowly add the milk mixture to the yogurt mixture. Don’t do it too fast because it will get lumpy. Divide into small cups. Clear ones work the best because you can see the layers. Put these in the fridge and chill until they are set. About 1 hour. When the milk pudding is set, start making the Sakura layer. You will need cherry blossoms, sugar, water, food color and gelatin. Heat up the water and sugar. Pour in the gelatin. Add some food coloring. You can add a small amount of red or pink. Drain the cherry blossoms and then place them in the liquid. Allow this to cool. Remove the milk puddings from the fridge. In each cup decorate with one or two cherry blossoms. Try to lay them out nicely. Serve chilled. This will also be pretty in a larger dish. These milk pudding cups are creamy and sweet. There is no cherry flavor. The cherry blossoms add a pretty touch and taste a bit like the Chinese preserved plums but it is only a mild light flavor. Next time I make these I will probably try to use a red flavored jello for the pink layer to give it a different taste. In a sauce pan, heat up the milk until it is about to boil and add the sugar. To this add the gelatin and stir to dissolve. In another bowl mix together the yogurt and heavy cream. Slowly add the milk mixture to the yogurt mixture. Don’t do it too fast because it will get lumpy. Divide into small cups. Clear ones work the best because you can see the layers. Put these in the fridge and chill until they are set. About 1 hour. When the milk pudding is set, start making the Sakura layer. You will need cherry blossoms, sugar, water, food color and gelatin. Heat up the water and sugar. Pour in the gelatin. Add some food coloring. You can add a small amount of red or pink. Drain the cherry blossoms and place them in the liquid. If you are afraid they are salty, try one out. If it is too salty, rinse the blossoms in some fresh water. Allow this to cool. Remove the milk puddings from the fridge. In each cup decorate with one or two cherry blossoms. Try to lay them out nicely. Carefully pour the liquid into the cups. You can adjust the flowers if they move. Place them back into the fridge to set, about 30 min to 1 hour. Serve chilled. Good to know, I’ll try it but not much of a cook though. Don’t worry if it fails. The first time I made this it didn’t work. Just keep trying and you will get it.